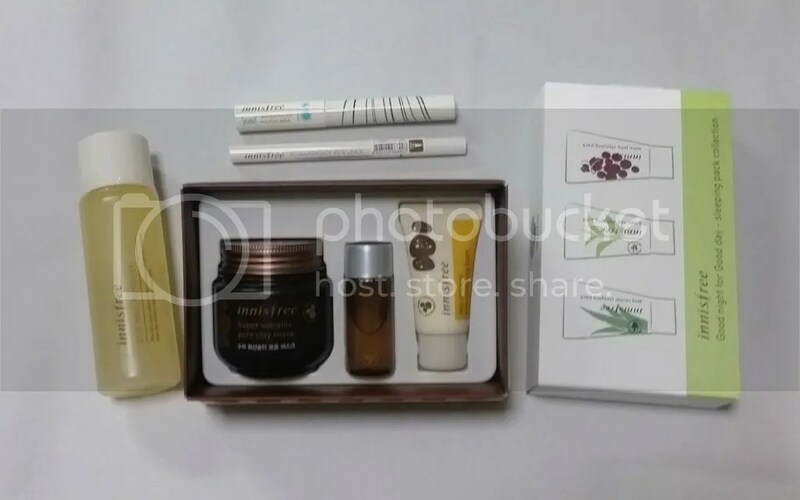 A quick beauty haul today – from a really affordable but great Korean brand Innisfree. I’ve tried a number of products from the brand and I’ve generally liked them. Innisfree has expanded quite quickly in Singapore over the last year and I’ve never bought anything directly from the stores locally so I wanted to check it out, plus it’s been awhile since I’ve used anything from the brand so I wanted to see what is new. I had so many things that I wanted to buy but as I have major renovations going on in my house, I restricted myself to a few. Let’s see what I got! This has Super Volcanic Pore Clay Mask in full size, with trial sizes of the Jeju Volcanic Pore Toner and Jeju Volcanic Pore Cleansing Foam. When I saw this set I just had to get it because it contained all the things that I’ve wanted to try, especially the mask! I just finished up my favourite Essence liquid eyeliner last month, so I thought I’d try something new. This also has one of those felt tips, but at first touch it feels a little too hard. We’ll see! I already have tons of new mascara waiting for me to use but when I saw what it looked like I had to get it! This has the teeniest tiniest brush head ever and it’s supposed to reach the smallest lashes. It really is a “microcara”. A review is definitely coming up for this soon! I didn’t need a nail polish remover but I wanted to boost the cost of my purchase as there was a free gift with purchase above S$50; I counted wrongly that I’ve already hit S$50 with the above 3 items! Doesn’t hurt though; my mum saw it and asked me to give it to her so I did. This was the free gift with purchase above S$50! This set has a mini 10ml tube each of the Aloe Revital Sleeping Pack, Green Tea Sleeping Pack and Wine Jelly Sleeping Pack. This is such a great gift! I get to try 3 different masks, and they are all beautifully presented in a very decent size. That’s it! I’m so excited to start trying out my new beauty toys – especially the masks and the microcara; will check back in later with some reviews on them! Have you tried anything from Innisfree?